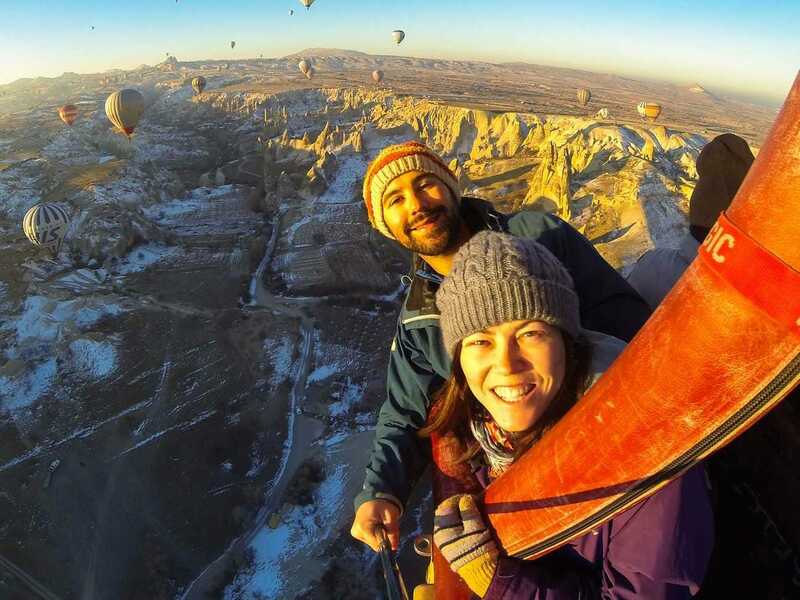 Courtesy of NOMADasaurusJarryd Salem and Alesha Bradford in a hot air balloon over Cappadocia, Turkey. In early 2014, Jarryd Salem and Alesha Bradford left their native Australia to backpack from Thailand to South Africa without taking a single flight. Since then, they have spent most of their time on the road, travelling everywhere from Mongolia to Vietnam to Tajikistan. When they spoke with Business Insider in 2015, they were earning $1,500-$2,000 a month as they travelled. In the past year, however, business has taken off, and they now earn between $2,000 and $6,000 a month. As they have increased their income, they have made it their mission to inspire others who want to lead a similar lifestyle. One way to do that is to be transparent about exactly where the money comes from. In an affiliate partnership, a blogger links back to a retail website. When a reader follows the link and makes a purchase, the retailer pays the blogger for the referral. NOMADasaurus makes anywhere between $100 and $1,000 a month from referrals on products like hotels and travel insurance, but Salem says some bloggers make much more. On a press trip, a hotel, tour company, or tourism board pays bloggers to come experience the area, service, or facility, and share it with their readers through stories, videos, and pictures. Sponsored campaigns are similar to traditional advertising. It might include everything from banner ads on the site to blog posts and social media posts featuring the product or service. Salem moonlights as a freelance travel writer for various websites. He makes anywhere from $20 a post to $500 a post, depending on the post and the site. For copywriting, he earns $150 per post. Bloggers who write for the biggest names can earn up to $2,000. Companies will also pay bloggers to run Twitter or Instagram campaigns, where the blogger takes over the company's account to share original photos and thoughts. Bloggers can also be hired for Twitter chats, where they hold a conversation with readers on Twitter about or related to the product or service. NOMADasaurus doesn't use use Google AdSense, but many bloggers do. Essentially, the service enables Google to place ads on your site, and pay you for the exposure. Salem explains that AdSense isn't usually a large income stream, and a blogger needs a high volume of traffic to see much cash from it -- usually $200-$300 a month for a banner ad. Individual photography and videography is a major income stream for Salem and Bradford, and one they generally keep separate from the blog. Companies hire them -- Bradford usually takes the lead -- to take photos of their properties, and the bloggers charge for that service. Another popular income stream is digital products like ebooks or online courses, which, once produced, become sources of passive income. An ebook usually sells for $15-$20 per copy and a travel blogger's course for $250-$300. Right now, NOMADasaurus doesn't have its own digital products, but Salem is currently writing an ebook about getting into the travel blogging business. If it does well, he'll expand into a course. In a brand ambassadorship, the blogger is hired to represent a company through posts, advertising, social media, images for commercial use, and product reviews. NOMADasaurus is currently in talks with an adventure clothing company, and if the contract pans out, the payment will be between $1,000-$2,000 a month, and the company will provide free clothing. 'This is quite common for a lot of large travel bloggers,' Salem says.